LOW FINANCE RATES. 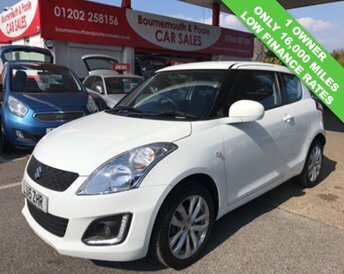 1 owner Swift offered in first class condition throughout with only 16,000 miles from new and only £30 per year to tax. Features include Pioneer nav, radio and cd system, USB point, air conditioning, Isofix, electric heated mirrors, rear privacy glass, remote central locking, alloy wheels, adjustable seats, multiple airbags, 5 speed gearbox and much more. We offer great finance packages to suit all budgets and credit scores good or bad. Simply click on the finance link on our homepage and fill out a proposal and we will do the rest. All Finance Rates Subject to T&Cs. Any Part Exchange welcome. For more information please call our office on 01202 258156 or Hayden on 07843 087334 or Darren on 07971 289371. Please visit us at Bournemouth and Poole Car Sales 540 Ringwood Road. Poole. Dorset. BH12 4LY. The Suzuki Swift is a common sight on UK roads and for a good reason. This sporty, good-looking hatchback is available with either three or five-doors and is lots of fun to drive thanks to agile and responsive handling. 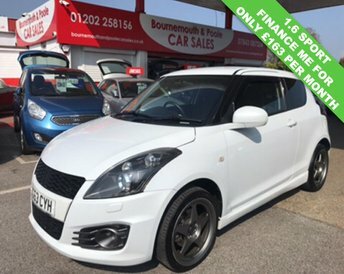 You'll find a great range of used Suzuki Swift models for sale in Poole with the help of Bournemouth and Poole Car Sales, all of which are reasonably priced to suit a range of budgets. Why not take a look at our latest stock online before contacting the team to book a test drive in the model of your choice. Rest assured we always go the extra distance to ensure that our customers find the right used vehicle to suit their needs.